With marketing automation, your company can attract home design and construction clients 24/7/365. Your website portfolio, blog articles, and other inbound marketing components like social media, SEO and email lead nurturing can be working to convert visitors and nurture prospects any time of the day or night. As you develop new marketing channels and experiment with social media, you also need to allow for the staff time and resources to manage your ongoing efforts. This is where many small businesses fall short when it comes to marketing and advertising. Fortunately, the beauty of digital media is that many of the repetitive daily tasks associated with inbound marketing can be simplified with marketing automation. There are both software and web-based options to accomplish this whether you're automating blog postings or social media interaction or handling lead nurturing through automated email marketing. As an example, Means-of-Production uses MailChimp's Blog RSS to Email campaign tool that automatically sends newly published blog articles via email and MissingLettr to post blogs on social media platforms repeatedly over a year. It's now possible to automate most of the process from conversion right through nurturing until it's time for personal contact from your sales team. As your inbound marketing begins to drive steady traffic to your website, and your CTAs are converting visitors into prospects, it's time to explore automation. To be successful, inbound marketing often consists of many repetitive tasks that can take staff time and company resources away from your core business objectives. One web-based platform that is particularly effective at organizing and automating your efforts is called Hatchbuck. Hatchbuck is a web-based suite of tools that includes a small business Customer Relationship Management (CRM) tool, drag and drop email design tool, a marketing automation component and in-depth analytics. Using the various tools to create landing forms on your website, you can capture your prospects information when they convert on your website. This information is then brought into the CRM tool as a new profile. Using the drag and drop email design tool, you can create beautifully designed and effective email pieces which you can then schedule, target and send to the prospects in your CRM to nurture them through your sales process. Creative email design is easy and effective with Hatchbuck. Hatchbuck also allows you to track and analyze your efforts with their deep analytics. Website visitors are rarely not ready to engage your services when they first convert on a landing page. Hatchbuck offers analytics and a notification system that can keep you abreast of your prospects actions, like how, when and what they are engaging in your emails and what pages they are viewing on your website. If a prospect exhibits a buying behavior like clicking a specific link or visiting a landing page on your site, you will be notified. With this information, you can contact the prospect at the appropriate point in the sales process. The true power of Hatchbuck rests with its all-in-one marketing automation platform for gathering and managing contacts, building effectively designed email pieces and automating their delivery. The Hatchbuck dashboard allows you to accurately track prospects throughout the process to determine where they are in your sales funnel. The “intelligent” algorithm scores your contacts based on their actions and engagement with your efforts, each contact is awarded a score indicating their level of interest and the probability of closing the sale. Clicking on a contact profile in the CRM gives you not only the prospect score but also shows the pages they've visited and tracks any communication you've had with them. You're able to store vast amounts of data in each profile that can be used to personalize and better target your emails to meet specific needs. You can group contacts, specify if emails are “lead nurturing” or sales specific and receive weekly emails from Hatchbuck updating you on your “hot” prospects. This is only the beginning of what is possible on Hatchbuck. The interface and dashboard are clean, clear and intuitive, and the underlying functionality is impressively advanced. Hatchbuck integrates with all of the apps you use through Zapier in just a few clicks. 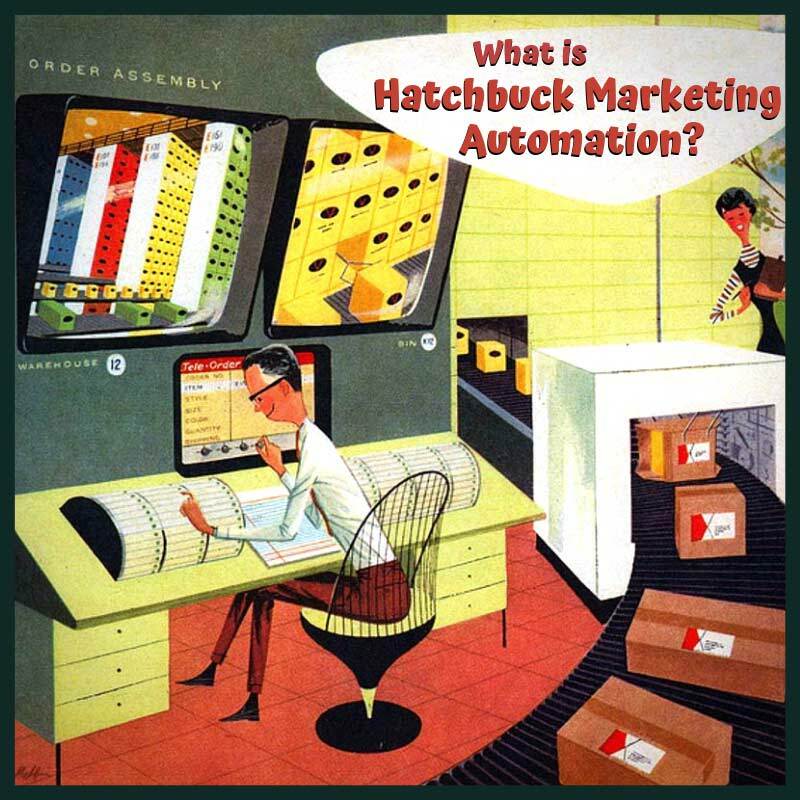 If you're ready to automate your design-build firm's lead nurturing and sales efforts, Hatchbuck is a great way to do everything inbound with affordable marketing automation software. I'm Micghael Conway, the owner of Means-of-Production, a full service marketing firm that builds Squarespace websites and marketing automation systems. I design sites that help you get found online, attract better prospects, and nurture capture leads. If you need help with a Squarespace site or want more information on automating your sales process click here to view my calendar and schedule a call. I am a Squarespace Specialist and Authorized Trainer. Together we can build a website that attracts the right prospects and converts them into better clients.